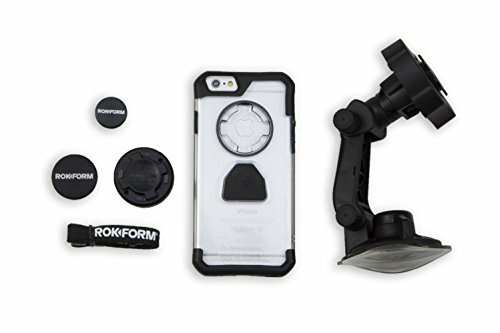 Avoid spending your hard earned money on a traffic ticket for holding your phone and Get mounted with the Rokform car mount Holder kit for iPhone 6/6S. Includes 3 different mounting options for your iPhone to make sure you are always hands free. The windshield suction mount makes the perfect car phone Holder for your iPhone 6/6S. With it's 210 degree tilt and 360 degree rotating head, you are certain to Get the perfect viewing angle while you drive. The suction cup base uses advanced suction technology to ensure your phone is securely mounted to your windshield yet easily dismounts to move it to another vehicle if you choose. Also includes the Rokform Bam magnet mount which is the most discreet phone Holder for your smartphone. This powerful Magnetic phone Holder will keep your phone Secure and mounts perfectly to any smooth flat surface like the car dashboard. And just in case you need a third mounting option, we have you covered with Rokform original RMS (remote mounting system). featuring our patented 4-point twist and lock mounting system, you can seamlessly snap your phone on and off in seconds. Unlike typical cradle mounts, all Rokform mounting options allow you access to all your iPhone ports and buttons. If you have any questions about this product by Rokform, contact us by completing and submitting the form below. If you are looking for a specif part number, please include it with your message.